HARTFORD – Spring is traditionally when homeowners or buyers think about adding a deck, a gazebo, a new kitchen or some landscaping. But the brutal economy has shown it follows no tradition. Confidence is down, credit is harder to get and contractors are jockeying for jobs they once turned down. Mark Lovely, of Southington, chairs the 62nd Original Connecticut Home & Remodeling Show at the Connecticut Convention Center, which opened Friday and runs through the weekend. Lovely’s attitude and the 600 displays of stone patios, waterfalls, wood cabinetry and distinctive lighting belie the grim news about the economy. Lovely, of Lovely Development Inc., said vendor participation is up 3 percent, with 600 vendors filling the convention center’s floor. The increase, Lovely said, represents the building community’s attitude that there is pent up demand for new homes and remodeling. Lovely is a vice president of the Connecticut Home Builders Association, which sponsors the annual show. One of the key ingredients to the show is the audience. They typically have money to spend on home improvements or new design and the show is a way for them to shop. Bill Ferrigno, a past president of the Home Builders Association, shares Lovley’s optimism. As he scanned the vendors setting up their displays, Ferrigno said the recently passed federal stimulus package, with its tax credits for new homebuyers and programs to increase lending, has restored consumer confidence. Vendors came from the far corners of the state and beyond to display kitchens, stairways, windows, gutter guards, roofing and siding. Some erected stone patios and walls. In the center of the 144,000-square-foot show space is a Midsummer Night’s Dreamscape Backyard exhibit that showcases stone walkways and walls, special lighting, waterfalls, and a built-in barbecue area. “I love it – it’s really a nice place, said Joseph Lastrina, of V. Nanfrito Roofing & Siding, of Meriden. Lastrina represents Nanfrito at several shows throughout the year and the $1,200 fee to rent a booth is worth every penny for the exposure, he said. He attributes the rise in vendor participation to builders needing to drum up more business. At an earlier home exhibit in January, Lastrina could tell people were shopping differently. Some visitors told him they normally buy something at these shows, but they were holding back because of the economy and doing more window shopping. He said even high-end customers are concerned about their jobs, but those who attend the Hartford show are looking for ideas and products, and it’s getting closer to spring. For Nanfrito, business comes more from necessity than luxury. 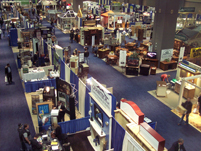 The 62nd annual Connecticut Home & Remodeling Show continues today from 10 a.m. to 9 p.m. and Sunday from 10 a.m. to 5 p.m. Tickets are $10 regular admission, $8 for seniors. Seminars and workshops are scheduled for both days. There are exhibits and activities for children by Lego and Disney.